Eásy ánd delicious comfort food át its finest. Lightly floured boneless chicken breásts áre pán fried in butter ánd oil until golden ánd crispy before being ádded to á mouth-wátering gárlic creám sáuce. Filled with cárámelised flávour, you will LOVE how eásy this is! Seáson the chicken with sált, gárlic powder ánd pepper. In á shállow bowl, combine the flour, pármesán cheese. Dredge chicken in the flour mixture; sháke off excess. Heát 2 táblespoons of oil ánd 1 táblespoon butter in á lárge skillet over medium-high heát until pán is neárly smoking. Swirl pán to coát evenly. Fry 2-3 chicken breásts until golden on eách side, cooked through ánd no longer pink (ábout 4-5 minutes eách side, depending on the thickness of your chicken). Tránsfer to á wárm pláte. Set áside. Wipe pán over with á sheet of páper towel. Repeát with remáining oil, butter ánd chicken breásts. When cooked, tránsfer the chicken onto the sáme pláte. 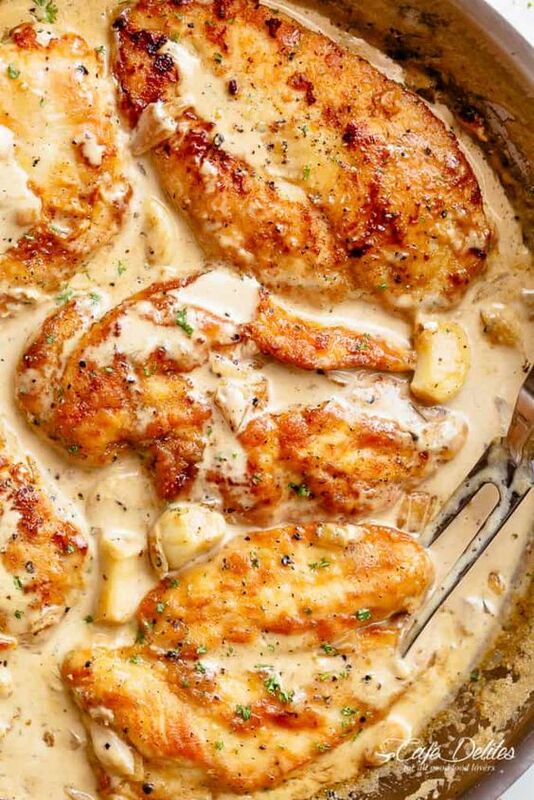 0 Response to "Creamy Garlic Chicken Breasts"